Note: It has to be tested with both themes (Boost and Clean). Verify that the first filter option is labelled as "All (except hidden)"
Note : It has to be tested with both themes (Boost and Clean). Prerequisites: Login as student Go to your Dashboard Open the course filter dropdown Test clustering: Verify that there are divider lines between the filters clusters as shown in the attached screenshot Test "All" string change: Verify that the first filter option is labelled as "All (except hidden)"
"Hidden" represent the complementary set to "All"
These options are all presented in a linear list which doesn't help to understand and distinguish them. 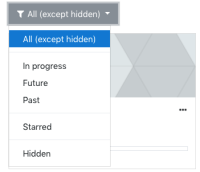 Think about changing the label of the "All" filter to something like "All visible" or "All (but hidden)" to make clear that this aren't really all courses.